Today's post is written by Peter Langland-Hassan and Agustin Vicente. 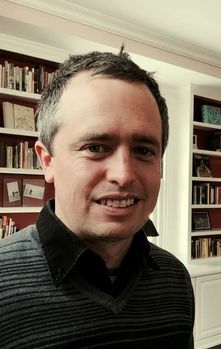 Peter Langland-Hassan is Associate Professor of Philosophy at the University of Cincinnati. Agustin Vicente is Ikerbasque Research Professor at the University of the Basque Country, Linguistics Department. 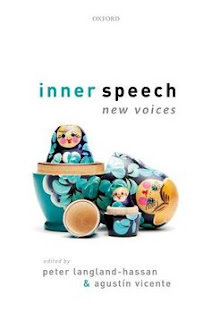 In this post, they present their new edited volume"Inner Speech: New Voices". Our new anthology, Inner Speech: New Voices (OUP, 2018), is the first in philosophy to focus on inner speech—a phenomenon known, colloquially, as “talking to yourself silently” or “the little voice in the head.” The book is interdisciplinary in spirit and practice, bringing together philosophers, psychologists, and neuroscientists to discuss the multiple controversies surrounding the nature and cognitive role of the inner voice. Readers of this blog may be most familiar with theoretical work on inner speech as it occurs in the context of explaining Auditory Verbal Hallucinations (AVHs) in schizophrenia. Building on and amending early work by Christopher Frith (1992), a number of theorists have proposed that AVHs result from a deficit in the generation or monitoring of one’s own inner speech. Our book includes several chapters by well-known participants in those debates—including Hélène Loevenbruck and colleagues, Sam Wilkinson & Charles Fernyhough, Lauren Swiney, and Peter Langland-Hassan—that push the leading theories into new territory. Stepping back, as philosophers of mind, it has always been surprising to us how little direct attention inner speech receives in philosophy and psychology. From a pre-theoretical, commonsense point of view, you might think that talking to yourself silently is one of the most important—and certainly most common—forms of thought we enjoy. And yet, few contemporary philosophers or psychologists assign to inner speech an indispensable cognitive role. This is in itself ground for puzzlement: if we could get on more or less the same without talking to ourselves, why do we spend so much time in silent soliloquy? Perhaps the most common answer given by authors in our volume is that inner speech supports a special form of self-knowledge or self-awareness—that we would, in some sense, know less about our own states of mind if we suddenly lost the ability to generate inner speech. This idea is developed in our volume in different—sometimes incompatible—ways by José Luis Bermúdez, Christopher Gauker, Edouard Machery, Peter Carruthers, Alain Morin, and Keith Frankish. The neuroscientific analyses of inner speech provided by Sharon Geva and Loevenbruck & colleagues in the volume allow the reader to grasp mechanics of this important resource, grounding the nebulous topic of “self-knowledge” in experimental data. The last set of issues receiving extended treatment in the volume concerns how inner speech is produced, and the proper parts that are “assembled” in its production. Many find it intuitive to describe inner speech in auditory-sensory terms—holding having inner speech is somewhat like hearing someone (oneself!) speak. And yet, inner speech is not simply a matter of having certain quasi-sensory impressions of the sounds of words. Typically, we also simultaneously grasp the meaning of the words. So it appears that we need to represent both word sounds and the meaning of those sounds, during an episode of inner speech. Further, there is arguably an articulatory component to inner speech as well, whereby we simulate or imagine going through the movements needed to generate the relevant speech. Supposing that inner speech has these various components, how do they relate to each other? Can each occur on its own? Is only one inner speech proper? Can we experience the “pure meaning” aspect of inner speech by itself, without the articulatory or auditory components? These foundational issues are explored in chapters by Carruthers, Gauker, Loevenbruck et al., and Langland-Hassan. Their proper resolution should influence any explanatory uses to which inner speech is put.